At the Holodomor Remembrance ceremony held in Kyiv on Saturday, Nov. 25, a big board listed the countries that have recognized the Ukrainian Famine of 1932-33 as genocide: Australia, Argentina, Georgia, Estonia, Italy, Canada, Lithuania, Poland, USA, Hungary. Next to the list was a question: "[What about] Ukraine's Verkhovna Rada [the parliament]???" It didn't take long for the Rada to follow suit: on Tuesday, 233 out of 450 PMs voted in favor of the bill (UKR) recognizing the Soviet-era man-made famine, which took millions of lives, as genocide against the Ukrainian people. Not a single Communist PM took part in the vote, and only two members of prime minister Victor Yanukovych's parliamentary faction (186 seats) supported the bill. 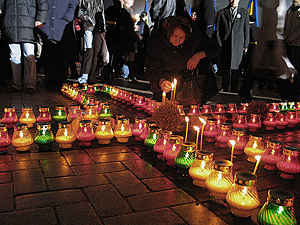 As hundreds of other Ukrainians, LJ user eagle_x came to Kyiv's Mykhailivska Square on Saturday to light a candle in honor of the Holodomor's dead. He posted photos from the mournful ceremony - here and here - and discussed the subject of Holodomor with two LJ users from Russia. l_mel: Well, yes, I'm aware of this! There are also rumors that your current president intends to accuse Russia of genocide... IMHO, it wouldn't be too smart of him. eagle_x: I don't think that adequate, reasonable people of the two coutnries would be accusing each other - this is "one." I'll reveal (or maybe it's not news to you) that our Yushch is soft :) he won't have the courage to accuse anyone - this is "two". I hope you remember that Stalin was an ethnic Georgian? Maybe we should accuse Georgia of genocide as well? :)))))))... - this is "three." I don't think there'll ever be reparation demands... Most of the real culprits of this cruel extermination are already dead and many have been left in obscurity... [...] And the moral of this is that the dead are not going to rise in order to demand some compensations - and not a single compensation is going to bring them back... Their memory should be honored with silence and a candle... And history's lessons should be remembered always and not allowed to happen again, neither at [your side, nor at ours]. I've received an objective education in politology. And I'm not inclined to defend [...] anyone, but in 1930-32, not only Ukrainians were starving to death. And some more on showing off: I think that a remembrance day isn't some showing-off action... People used to come in great numbers to the Holodomor Victims Memorial to honor the dead without hiding... And that the President was there as well - it shows that in our country it's not that bad yet... Extermination of millions of people isn't like mourning one person - it's HORROR!!! Maybe you want to repeat your words to the old women who are still alive, who survived that and lost their relatives?